Defending (Kind of) Enda Kenny... - Charley Brady - Opinons; My Own. This article is from the February 2014 issue of Chicago’s ‘Irish American News’. As you will probably know by now, Kenny and his Minister for Enterprise John Bruton had thrown their boogie-shoes on and were jiving around the Gulf region on what some cynics are saying was yet another junket but which, in fairness, was a legitimate trade delegation. After a trip–in the company of representatives from Enterprise Ireland (no comment) — to the Saudi Arabian Chamber of Commerce, they shimmied on to Doha in Qatar, before hitting Abu Dhabi and Dubai to excited squeals of delight from the gathered populace. Anyway, it seems that a lot of people are very upset at Enda Kenny for not going in with both fists swinging, challenging the Saudis on their lamentable idea of what way a civilized 21st century nation should behave. According to an assortment of politicians and even several ‘human rights’ groups, Enda should have taken this opportunity to make it clear that he doesn’t approve of such things as… oh, I don’t know what they wanted, really. For him to have a go at his hosts over their frequent executions and their unwillingness to give driving licences to women, I suppose. That kind of thing. That’s the problem though, isn’t it? These were his hosts; he and Bruton were guests. It’s not as if Ireland is the centre of the world. And if you’re invited round to your neighbour’s gaffe you don’t go in yelling about the state of the wallpaper. If it had been a different kind of delegation then I would say sure, we must always raise the issue of human rights. In this case, though, it would have been ludicrous. Enda Kenny is a man who avoids debate within the country of which he is Taoiseach so he’s hardly going to slip into his Mighty Mouse outfit in front of a group of obscenely wealthy Arabs in order to read them the Riot Act. And even though I’ve a fairly decent imagination I can’t see John Bruton turning into Secret Squirrel and handing out a lecture to a crowd who might just behead him for his input. Well, obviously. 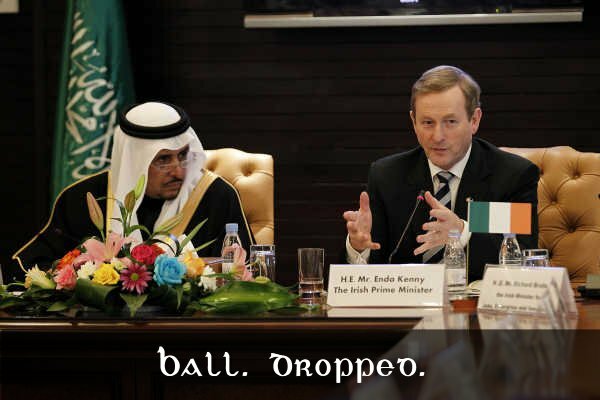 Obviously Ireland will be working closely with Saudi Arabia. And I’ll bet that Prince Salman, who had possibly only been briefed hours before on precisely who Enda Kenny was, breathed a huge sigh of relief when he heard the good news. In fairness, though: what on Earth was the Taoiseach supposed to say? And if they are honest, what would those politicians who are sniping and scoring some pretty pathetic political points on the back of it have said themselves? I’m willing to bet that the silence would have been just as deafening. Heh. In fairness, Mr. Adams is on record as saying that he never had any involvement with the said organisation and that’s good enough for me. This is where Mr. Kenny shines, really; in the words of the song, he says it best when he says nothing at all and that is certainly what he’s doing here: saying nothing at all. There’s probably no truth to the rumour that Crown Prince Salman then pulled out a map and asked Enda to point out to him where exactly Ireland was again in relation to Germany. It’s OK. I’ll take that one, Mr. Kenny: on its knees waiting for Angela Merkel to give us another pat on the head, that’s where. Or am I talking to people who honestly believe that we’ve done our time and are now coming home to a yellow ribbon tied around the old oak tree? There’s yet another winged pig gone by! Whilst I’m on things of a Muslim bent, how disappointing to hear ex-Monty Python Michael Palin, a man I have a lot of admiration for, telling us last week that he would never make jokes about the good-humoured followers of Allah. Yeah, it’s that new thing called sarcasm. So it’s all right then to poke endless fun at Catholics (I can’t believe I’m defending the religion of my father) and Jews but it’s NOT OK to poke fun at Muslims? He’s now joined the ranks of the once-admired Sarah Silverman in avoiding this weird no-man’s land. Timely, because the horrendous season of Awards is upon us once more, when all the once-a-year cinema goers come out of their nests. They’re like the once-a-year-drinkers who show up on the ghastly St. Patrick’s Day just in order to vex people who are sane. Here’s a prediction for Oscar time: Gravity is bound to get at least one because no one wants to point out that the Emperor has no clothes; and 12 Years a Slave should do really well because it’s about white people being beastly to black people and no one is more fake-liberal than an Oscar-luvvie. Ah, I’m just being a grouch. I’m really looking forward to that one, especially since the great Paul Giammati is in it. Europa Report won’t get any because it’s brilliant. Neither will Mud.